Our aim was simple, ie. to spin the record in the nearest possible way to the master and to enable the tonearm to emulate the cutter head. The fine quality sound of the turntable is due to its massive construction. The base is of solid brass which is clamped together from two pieces and has good damping properties. The main shaft, which is 28mm in diameter, is fixed into this base. The platter is a sandwich construction of aluminium and acrylic plates screwed together in pre-stressed form to damp all unwanted vibration. Hard non-metallic material is used for the bearing which, together with a ruby ball, is lubricated in an oil pool to provide one point contact with minimum vibration and noise. Two motors are mounted separately in their own heavy brass towers . Two pulleys via two belts give stable symmetrical drive to the platter. The electronic power supply generates controlled feed from quartz to both motors in such a way that any vibration in the drive is minimised by the driving coils of each individual motor. See NEW below. 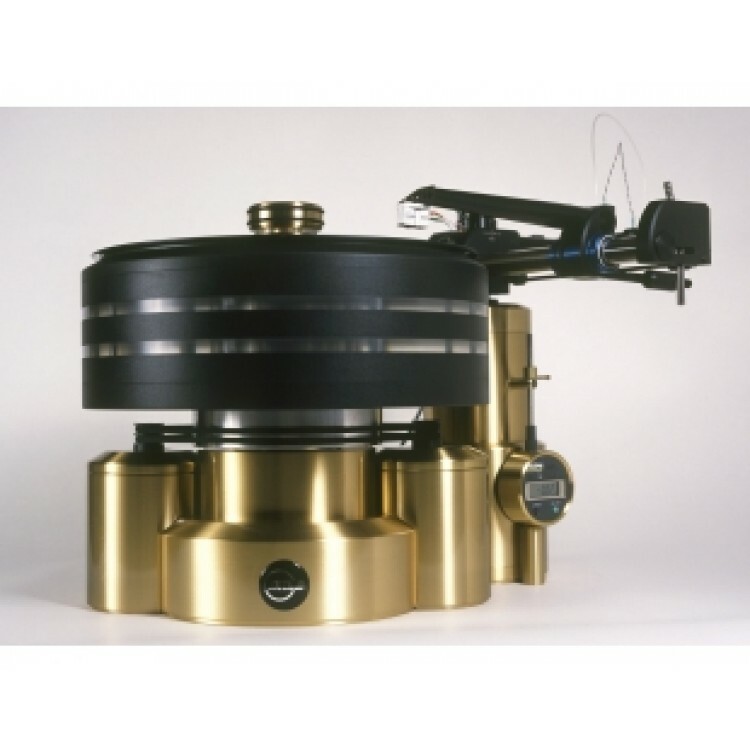 A heavy brass and acrylic clamp provides additional damping of the vibration created by playback, as well as flattening curved records. The record is pressed securely to the platter- mat, which is a semi-hard combination of rubber and textile. The tonearm tower is a massive brass unit and the armboard can be exchanged to accommodate various tonearms. The mass of the tower gives structural and damping rigidity to the tonearm. The unit allows for VTA adjustment during normal use without loss of rigidity or azimuth. The movable part is supported via a linear ball bearing 30mm in diameter and 100mm in length which gives firm support while allowing VTA to be changed. Adjustments can be made in a range of 80mm, each turn of the knob representing 0.1mm precisely. In order to simplify adjustment a micro meter gives a digital readout in the range of 12mm at exactitude of 0.01mm. These adjustments are repeatable. Additionally, a lever on the side of the tower allows for three basic positions, normal, a setting for thin records and higher for thicker records of 180 grams. Stabi XL was first introduced in 1999. Stabi XL2 ( 2008) differes from Stabi XL due use of different power supply PS XL 2.